So yesterday I shared with you everything I received from Luke and his grandparents for Christmas and as part two I am now going to be sharing with you everything I received from my mum and my brother! I say everything, there's about four or five presents which haven't been included purely because one of them is at Luke's and a couple of them I'm wearing and didn't want to take out (aka, some gorgeous pieces of jewellery). By no means am I bragging about anything which I have received for Christmas! First things first is this gorgeous baby pink Remington Complete Hair Gift Pack. I really needed a hair dryer for Luke's house because his Nan's one is pretty old and rubbish and takes forever to dry my hair and I saw this one and fell in love. 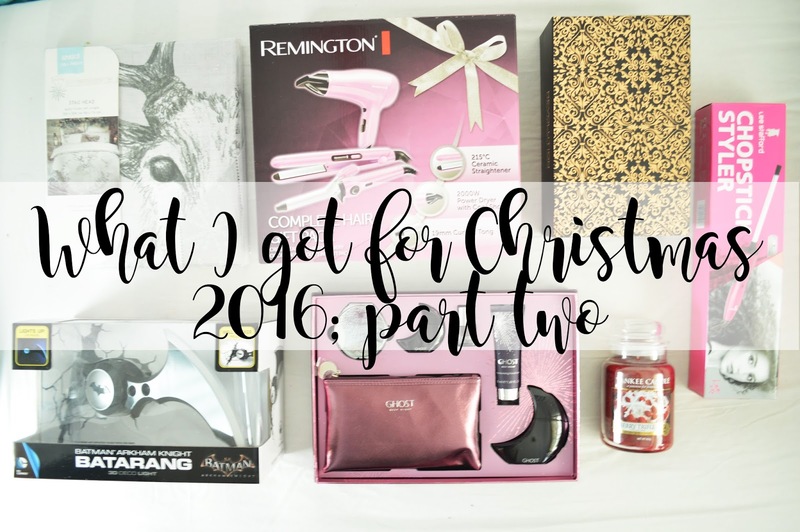 It also comes with hair straighteners and a curling iron which is great to also leave at Luke's house so if I ever want to do anything to my hair then I can! The first gift from my Brother is this incredible Batarang light which you screw into the wall and it lights up. Let's face it, I love Batman, anything which includes Batman and he saw this and knew I would absolutely love it and I do! I cannot wait to fix it onto my wall! I haven't decided where to put it yet though. I also got another curling wand from my Mum, this is one to create afro curls though and I love it. I have long hair, if you follow me on any of my social media accounts then you'll know it's pretty thick too! So one day I'm going to have my mum curling my hair for me and I simply cannot wait to see what it looks like! Of course I'll be posting pictures too! Ghost is one of my favourite perfumes (I actually included it in my December Favourites) and Superdrug were selling this incredible set for only £30 around Christmas and well, both me and my mum had to get it! It includes a 50ml bottle, a tiny little travel size bottle, a compact mirror, hand cream, nail varnish and a little bag too! Everything a girl needs to feel sassy! I love it! I saw this in the Dunelm magazine in November and completely fell in love; I absolutely love stags and fawns and anything in between. It is beautiful! However my local store didn't have it in stock so my mum asked my brother to have a look in the store where his girlfriend is and he managed to pick it up! Ah I'm so glad, and it's not too Christmas-y meaning I can have it on my bed all year round; wooo! The second present my brother bought me was the Large Berry Trifle Yankee Candle. Oh my god, I was so excited when I opened this as I loved it but didn't want to pay the price for a large Yankee Candle; £21-£26, no thank you! But my brother is absolutely insane and paid it and I am so grateful! I recently smelt this when I spotted it in a garden centre and I hadn't seen it anywhere else but he managed to find it online! If you haven't smelt this, you need to; it is incredible! Not only did I manage to get my hands on the Makeup Revolution massive Christmas storage chest, but I also managed to get my hands on the 12 days of Christmas chest too! Well my mum did. Makeup Revolution is my favourite brand of all time (Apart from I do love Rimmel London) and when I saw this, I fell in love. Luckily enough Superdrug were doing an incredible deal on this on Black Friday and you could pick it up for I think £20 or £25 which is so much better than £35! I will have a blog post coming all about this, or maybe a few; we shall see. So keep your eyes pealed! The last present I am going to be showing you is my beautiful Thomas Sabo charms which my mum bought me for Christmas. Two years ago my mum started a Thomas Sabo charm bracelet for me, so every time something wonderful happens in my life I can collect a charm for it to keep as a little memory. My first charm was a prom shoe to represent my prom which I love and then I think my Mum bought me the letter K for my name. This Christmas she was so lovely and bought me not one charm, but two! The first one is a blue beetle which is to represent passing my driving test back in May; I have a blue car and this is the prettiest car charm they sell! She also bought me a stunning aeroplane to represent going on holiday abroad for the first time back in June as I only got my first passport in January last year! I absolutely love these charms and mum I know you'll be reading this; thank you for everything this Christmas! You well and truly spoiled me. Did anyone get anything exciting for Christmas? What lovely presents! I really love the charms as they tell a story. I can't wait to see what your hair looks like after styling with the chopstick curler. I have super thick hair and would love to see how it looks!